I’m not usually big on the whole FPS genre, let alone multiplayer-focused FPSers, but for Screencheat I’ll make an exception any day of the week. A solid throwback to the fond memories I have of split screen Goldeneye and Perfect Dark, Screencheat is a unique, creative and endlessly entertaining multiplayer-orientated shooter, and as good as it was on PC, it really feels at home on the console. Related reading: Matt's review of Screencheat on PC. The idea is simple, but the execution really requires an entirely different skillset to the shooters that you’d be used to playing. 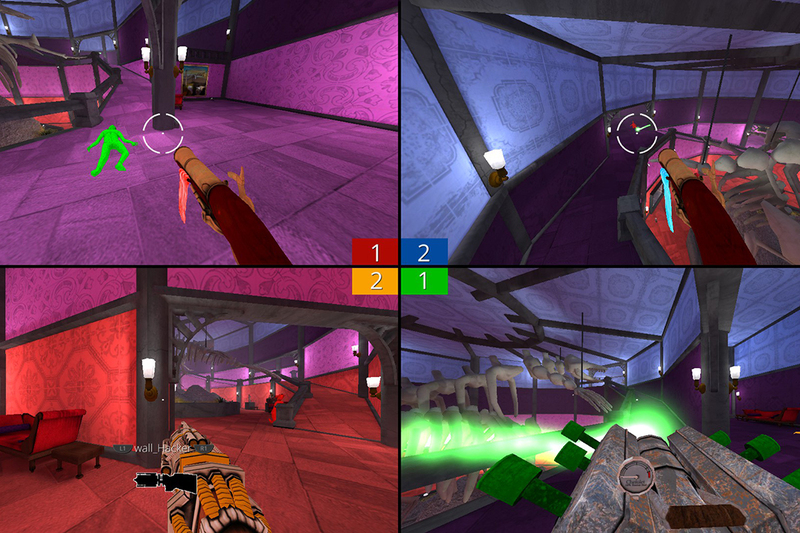 The screen is split into four (or even eight, for the console release), as is normal for a local FPS blastathon. Each player, as normal, has their own “square” of the screen that is their view into the arena. Each player picks a weapon and then aims to take out their opponents with it. The difference is that with Screencheat you can’t see where your opponents are in your “square” of the screen. They’re invisible to you. Instead, you need to look at your opponent’s squares, figure out where they are on the screen, and then use that knowledge to shoot them. It’s a bit of an insider’s joke. People who grew up with split-screen gaming remember fondly just how irritating it was for a friend or sibling to “cheat” by looking at your screen and figuring out where you are. You might set yourself up in the perfect stealth spot for some sniping action, only to have an irritating… poop… figure out where you were by looking at your screen to figure out where you are and ruin the glorious headshot you had planned in your mind. 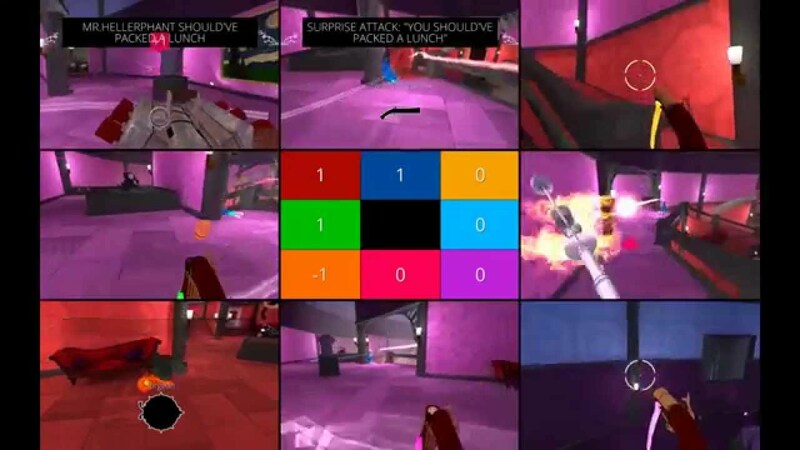 By turning this frustration into the actual gameplay mechanic the team at Samurai Punk have managed to build a game that requires real skill to become good at – not only do you need to monitor the “screens” of each of your opponents, but you then need to perfectly accurately line up shots where the closest you’ll get to figuring out where they are exactly is a muzzle flash when they fire their own guns. All weapons are one-hit-kills, too, so there’s some real intensity to combat, and sitting idle is not a recipe for success; not only is it easy to figure out where you are if you’re not moving around much (because all arenas feature key landmarks and are colour coded), but it also means that you’re a much easier target. Corridors and environments tend to be tight and confined, so if you’re not moving around the whole level constantly, you’re a sitting duck. The weapons themselves are a fun bunch. Melee combat isn’t particularly effective in a game like this, but I can’t resist using a hobby horse at least once each round. How many other games have hobby horses of instant death, after all? Environments look a little simple because they are colour coded, but what is key is those environments are well designed, with plenty of landmarks to help identify where the other players are at, but also opportunities to duck behind obstacles and make strategic use of jump pads and the like to get some vertical movement strategy into the mix. With 11 maps to chose between, nine modes, ten weapons, and even bots to practice in single player between multiplayer sessions, there is a lot more content in this game now than there was when it first released on PC. It now feels like a full and cohesive package, and the variety on offer is more than enough to allow dozens of hours of fun. Of course, while there are those aforementioned bots, the real strength of Screencheat is the local multiplayer. Designed explicitly to be the go-to game you’d grab when you’ve got a group of friends over on a Friday or Saturday evening and play while ploughing through a case or two of beer, this game is riotous. Because matches are frequently determined by a single shot, the volume in the room will escalate steadily as the match goes on. Sure it’ll start out friendly enough, but before long the friendly jabs will become sledging, which will turn to swearing and, eventually controllers thrown. In the best way possible, of course. This is the kind of game that can drive you to tears of laughter, and while it is mechanically sound and it’s possible to get good at the game, it is by no means whatsoever an eSport title. This is a party game through and through. Holding it back, ever so slightly, as a party game is the reality that it is initially incredibly confusing to wrap your head around. The eye naturally wants to view the action through the lens of your particular window into the play space, so to be forced to look at other people’s windows creates a very gamey kind of experience that is not accessible for people who haven’t been playing games for half their lives. 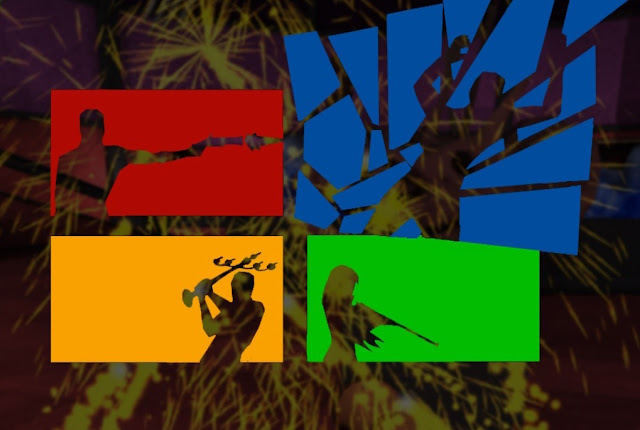 This is a multiplayer party game for the veterans alone. But it is riotous fun, and the development team have done a great job in optimising it for the home console experience. Where I encountered plenty of bugs in the early stages of the PC release, the PlayStation 4 release seems to be robust. For people who can’t pull together a full crew for a local multiplayer game, it’s also possible to play with a combination of local and online players, and while some of the soul is lost when playing against people in the same room (where you can lean over to them and swat their controller out of their hands), it’s still good, clean fun. And on that note it is worth mentioning that this is a shooter that the whole family can enjoy, as there is no gore, and while you do see the other character wink into existence when you succeed in KOing them, the ragdoll physics are there for comic value alone – think Warner Bros. cartoon silliness. Related reading: Our interview with the Aussie development team behind Screencheat. Screencheat is my favourite local multiplayer game on the PlayStation 4. It’s a nice, small, download that I’m going to leave sitting on the harddrive for whenever I have friends over, and while that might not happen on a weekly basis (I like my space, okay), each and every time I pull the game out, it’s going to more than validate its worth. Because it is simple, silly, fun, and it’s a great start for Aussie games on the PlayStation 4 this year.